During college, I worked at children’s bookstore (lucky me!). We always kept book lists to help customers. One of the most popular requests was for children’s books about horses. At the time, there were not a lot of books for young children that were about horses. Well, that has changed! Clip-Clop by Nicola Smee is for the youngest crowd. It’s a rhythmic tale of all the farmyard animals climbing on the horse’s back for a ride. I like that Busy Horsies by John Schindel uses photographs of real horses. The text is simple and great for babies and toddlers! Ten Horse Farm by Robert Sabuda is an amazing pop-up book that showcases all the things horses can do such a galloping and grazing on the farm. All horse lovers will want this one. Horseplay! by Karma Wilson is a favorite in our house. Well, really any Karma Wilson book is a hit in our household! In Horseplay! the farmer investigates why his horses are always so tired during the day. He soon discovers that there is too much horseplay going on in the barn at night and he is determined to put a stop to it! Also, check out our Sight Word Horseplay Game! to accompany this fun book. Fritz and the Beautiful Horses by Jan Brett is the story on an excluded pony who becomes a hero. Horses: Trotting! Prancing! Racing by Patricia Hubbell is about all the things that horses do. The book also identifies many different kinds of horses. Cowboy Small by Lois Lenski is a vintage book from the 1940’s. It’s a story about Cowboy Small and his horse, Cactus, and all the work they do on the ranch. Every Cowgirl Needs a Horse by Rebecca Janni is about a cowgirl at heart who wishes for a horse for her birthday. Will she get her wish? Horses by Gail Gibbons is a non-fiction book about all things horse related. Winnie the Mini Horse by Andra and Morgan Ebert takes us to a miniature horse farm where a new horse has arrived. Soon after, the horse is taken to a new farm where she has to make new friends and adjust to a new environment. The Black Stallion by Walter Farley is a classic adventure story! Marguerite Henry has written several chapter books about horses including Misty of Chincoteague and Stormy, Misty’s Foal. Thanks for sharing this great list of books. I am adding a few to my to read list. My daughter loves horses! Thanks for another great book list, Jodie! Every one of these is new to me. 🙂 Pinned it! Thanks Anna! I’m glad you found some new books to check out! 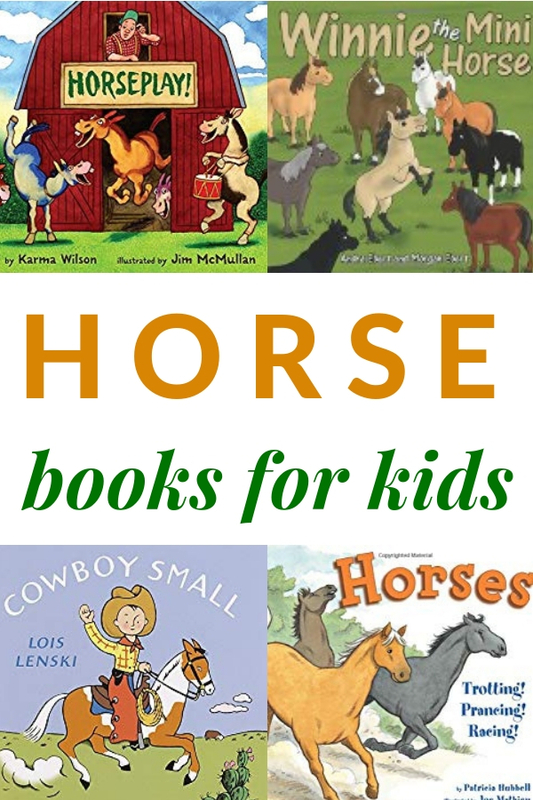 Great list for the horse loving readers 🙂 We loved Gail Gibbons and Lois Lenski–always nice to see them make a list. My son loved the Billy and Blaze series of books when he was young. Sheila, thanks for the Billy and Blaze recommendation. I’ve just looked for books about horses on our bookshelf and was surprised that we haven’t any! I loved Black Beauty as a child. I hope you enjoy exploring some on the list! So glad you came and joined the party! I’m looking forward to lots more great recommendations from you in the future on Booknificent Thursday! I love The Magic Horse of Han Gan by Chen Jiang Hong if you want a multicultural picture book to add to your list Jodie.